The Residence of Prince Miloš in Topčider, 2, Patriarch Pavle Blvd. 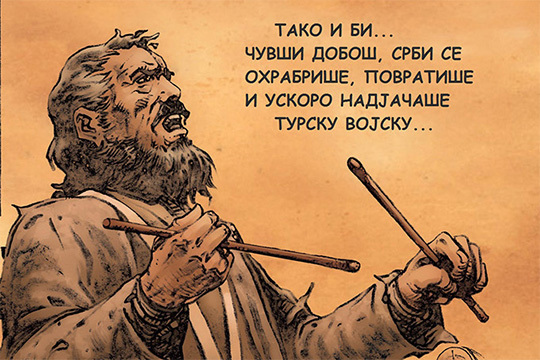 In a unique, exciting and unusual way, using the format of comics, the exhibition „Here am I, here are you... The recollections of Prince Miloš” revives one of the most important periods of modern Serbian history. Although comics are still a popular medium, and the events they present a rich source of inspiration, this is the first time they are displayed in the museum in this way. The special charm of the exhibition lies in the original artifacts from that period, which supplement the storyline. 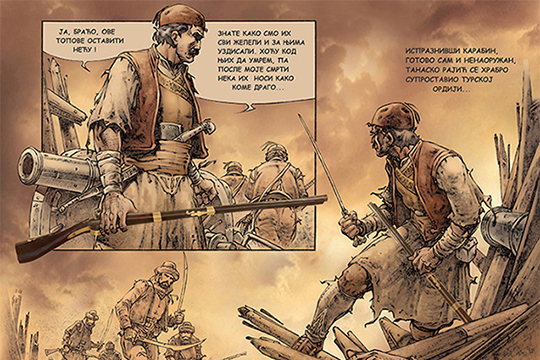 Goran Djukić Gorski, the comics artist, draws the stories meticulously. With a mastery of mass scenes and a keen eye for detail, he simply forces visitors to return to certain frames after having read the whole story, and to indulge themselves in the enjoyment of his illustrations. The authors of the exhibition, museum curators Izabela Martinov Tomović, Borislav Korica, Vladimir Merenik and Boško Ljubojević, not only wanted to popularize and refine this artistic narrative form, but also to present the well-known events in all their complexity, in a manner unusual for a museum display. The exhibition has been realized on the occasion of the two-hundredth anniversary of the Second Serbian Uprising, with the support and patronage of the Ministry of Culture and Information of the Republic of Serbia.